Another month, another round for the Fed! In case you haven’t visited our trading calendar yet, you should know that the FOMC statement is one of the most closely-watched potential catalysts of the week. Unless you’ve been too busy making your “Winter is Here” shirts, then you should know that the Fed has raised its interest rate range by 25 basis points for the second time this year last June. With regard to the projected path for the Fed Funds Rate, FOMC members still expect the Fed Funds Rate at 1.4% by the end of the year. And since 1.25% is the upper bound of the new target range, then that means the Fed is still open to one more 25 bps hike by the end of the year. The Fed’s hawkishness, commitment to its rate hike schedule, and the additional deets on how it plans to “trim” its balance sheet all boosted the dollar during the release. The Fed’s meeting minutes told another story, however. See, market players had expected even more details on the members’ plans to reduce their bloated balance sheet. Instead, we found out that FOMC members actually had difficulty agreeing on key issues such as the expected duration of low inflation; the aggressiveness of rate hikes next year, and the exact schedule of normalizing their balance sheet. As a result, the dollar lost support across the board and stayed down for the rest of the week. Since the Fed won’t be releasing a Summary of Economic Projections or conduct a press conference after the release, market players aren’t betting on any major announcements from the central bank tomorrow at 6:00 pm GMT. FOMC members found it easy enough to shrug off weak inflation last month, as they chalked it up to temporary reductions in prices of wireless phone plans and prescription drugs. This led traders to believe that the Fed could still deliver on a third rate hike this year. Thing is, Yellen wasn’t as confident on the fleeting nature of low inflation a few days later. In her semi-annual testimony before Congress, she acknowledged that inflation is a “two-edged” problem which means that prices can rise too slowly or jump quickly if a tight job market led to high wages and boosted prices. She also added that “there may be more going on, and we’re watching inflation very carefully in light of low readings” but reassured that it’s “premature” to conclude that inflation would remain below the Fed’s 2.0% target despite the recent downtrend in price increases. Uncle Sam’s CPI stands around 1.7% from a year earlier in June, which is lower than its 2.3% annualized reading back in January. Fed members shared their first discussions about trimming their balance sheet back in May and provided details on how they’re going to do in last month. Some analysts believe that the Fed will announce the exact start date of the balanced sheet run-off this month but others have pointed out that the disappointments in inflation reports have given the Fed room to delay the announcement until September. The Fed could still end up adjusting its tune this month, though, and say that it will begin implementing its balance sheet normalization “very soon” or “at its next meetings” instead of “this year” as they said in June. Based on the previous monetary policy statements and central banker speeches, it’s likely that this week’s FOMC statement will attempt to strike a balance between recognizing a longer period of low inflation and optimism over strong economic activity and labor markets in the U.S. 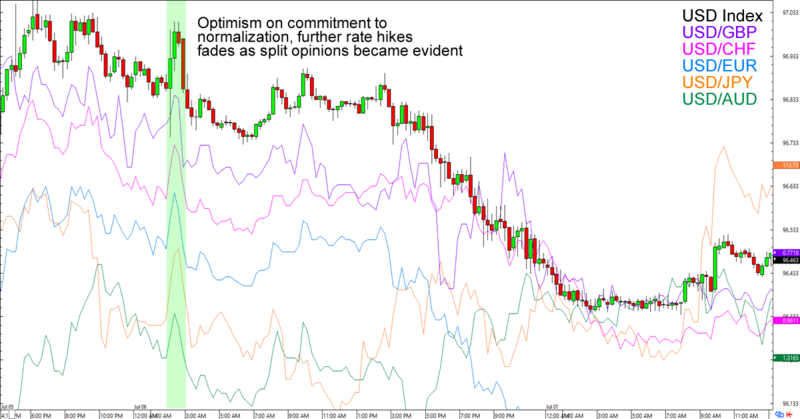 The volatility will come from how markets react to the Fed’s optimism. If the Fed shows its unwavering commitment to raise rates by another 25 basis points this year, then we might see the dollar hold on to its gains from the previous sessions. But if FOMC members decide to temper expectations by talking about subdued inflation or NOT talk about its plans to reduce its balance sheet, we might see the Greenback weaken against most of its major counterparts. And then there’s the possibility that the dollar will barely react to the release as market players decide to wait for more economic data before placing their longer-term positions. In any case, make sure you keep your eyes glued to the tube during the event! Oh, and remember that no position is a position, so feel free to stay in the sidelines if you’re not comfortable taking risks around the release.